Sarah Sipe’s Circulus has been released. 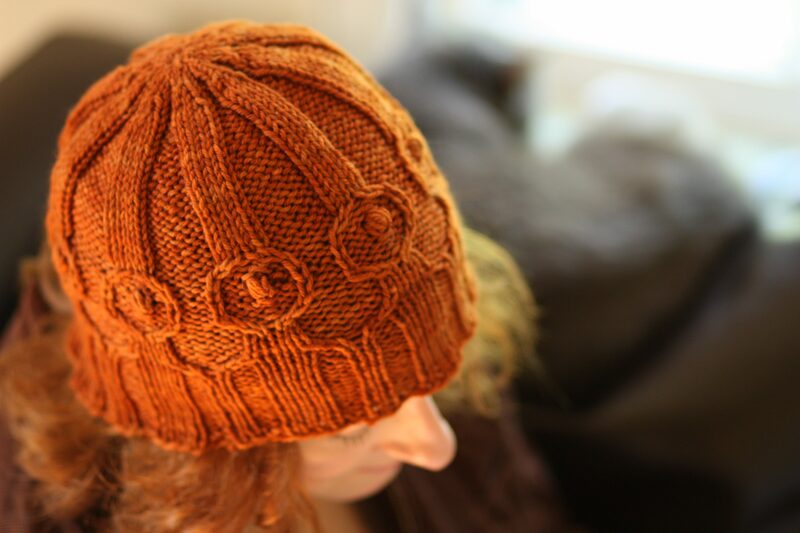 This is the last of the six hats we have designed based on ancient spindle whorls; the others can all be found in the ebook collection, Our Heads are Spinning. Whorls featuring circle designs have been found at archaeological sites around the globe; the circle-with-dot is nearly as widespread. The whorl that inspired this particular design came from a Roman-era Coptic site (Egypt), but similar whorls have been retrieved from German, Sassanian (Iran), Bactrian (Afghanistan), and Mexican sites. This beanie features a variation on the banjo cable with a two-row nupp in the center to mimic the common circle-with-dot motif. Measurements are made with hat blocked and stretched to appear like the example. This is a very stretchy hat due to the ribbing, and will fit a head up to 4 inches [10cm] larger than circumference noted. Child: 9 inches [22cm] deep and 17 inches [43cm] in circumference. Adult Woman: 10 inches [25cm] deep and 20 inches [50cm] in circumference. Adult Man: 11.5 inches [29cm] deep and 22 inches [56cm] in circumference. The example shown is an Adult Woman size on a 22 inch [56cm] head. 16 stitches and 22 rows over 4 inches [10cm] in stockinette worked in the round on larger needles. US size 6 [4mm] needles for working in the round. You should be able to knit in the round, do cables with a cable needle, and be familiar with a nupp.